Ted Nelson is the son of actress Celeste Holm and film director Ralph Nelson, but was raised almost entirely by his grandparents. He envisioned a hypertext scheme in 1960, much as Vannevar Bush did in 1945 -- a text processing system to allow file storage, manipulation, copying and editing. In 1965 he presented a paper at the Association for Computing Machinery detailing the concept he called "hypertext", and by 1967 he was calling it Project Xanadu. As conceived by Nelson, Xanadu is to be a multi-dimensional system for accessing, indexing, and preserving the world's vast stores of art and literature, with works available easily and perpetually, with the easy ability to "transclude" portions of documents, and with automatic micro-royalties assessed on every byte transmitted. 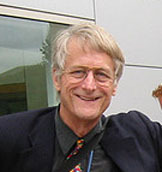 He also spent a year in the mid-1960s working for dolphin researcher John C. Lilly, headed two early efforts to retail personal computers, and edited the pioneering do-it-yourself magazine Creative Computing in the early 1980s. Not to be confused with the much simpler World Wide Web, Xanadu remains a system under construction, and has been an open source project since 1999. Among computer enthusiasts, Nelson is admired by many as a brilliant innovator, and derided by others as something of a crank. He is critical of the Web, describing it as a "mess that is strewn around us", and dismisses Tim Berners-Lee for purportedly oversimplifying his ideas. For his part, Berners-Lee has described Nelson as "a professional visionary." In a controversial 1995 article in Wired, Xanadu was described as "the longest-running vaporware project in the history of computing", but Nelson, now in his 70s, maintains that his project "will eventually prevail once people understand it."